US President Donald Trump said on Friday his summit with Democratic People's Republic of Korea's top leader Kim Jong-un would proceed as planned on June 12 in Singapore, and he looks forward to the day when he can take sanctions off the country. 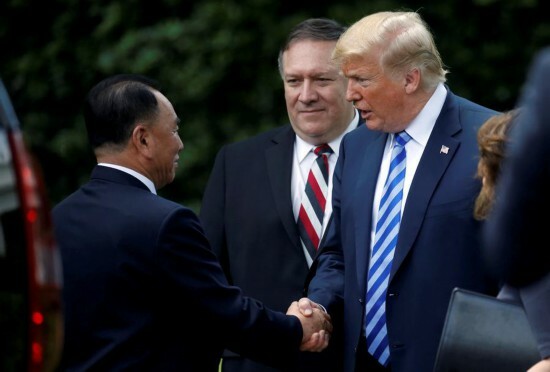 "The process will begin on June 12 in Singapore," Trump told reporters after meeting with Kim Yong-chol, vice-chairman of the DPRK's ruling Workers' Party of Korea Central Committee, who delivered him a letter from DPRK's top leader Kim. "I think it's probably going to be a very successful, ultimately a successful process," Trump said. Kim Yong-chol arrived at the White House Friday afternoon after wrapping up a two-day meeting in New Year with US Secretary of State Mike Pompeo.